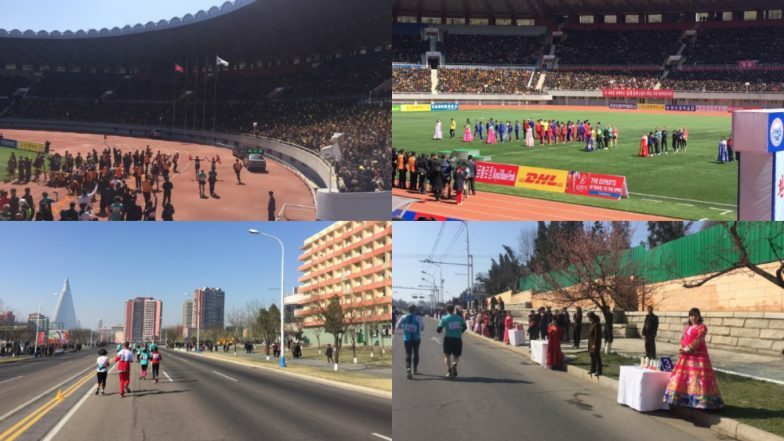 Pyongyang, April 7: With the reduced tensions in isolated North Korea, the number of foreigners doubled as last year gathered in Pyongyang Sunday for the city's annual marathon, says tour firms. Compared to last year's 450, around 950 Westerners entered the event, reports market leader Koryo Tours. Highlighted by North Korea as a celebrated event - part of the celebrations for the anniversary of founder Kim Il Sung's birth in 1912 - is one of the important days in North Korea's tourism. On this day, North Korea offers the chance to run or jog through the streets of the tightly controlled city in Pyongyang. North Korea Says Move Towards Denuclearisation Only in Exchange for Partial Relief from Sanctions. On Sunday's event, British Ambassador to North Korea Colin Crooks and Sweedish Embassy representatives were seen enjoying the day. Crooks took to Twitter and shared the beautiful images of the event. Followed by the 10 kilometres marathon, crowds were entertained by two North Korea Premier League football matches, which was followed by medals and closing ceremony. Even locals were seen serving refreshments wearing traditional colourful clothes. It is to be known that in 2017, the tension soared between the US and North Korea as the latter carried out a series of missile launches and leader Kim Jong Un traded threats and personal insults with US President Donald Trump. Due to this, Washington banned its citizens from visiting the North. The same year a US student jailed for trying to steal a propaganda poster who died in a mysterious coma days after his release. This made other countries subsequently raised their travel warnings. However, with the ease of tension due to the meeting of North Korean dictator Kim and US President Trump in 2018, the tourism industry in North Korea has revamped a little.